When you think of visiting Cambodia as a tourist, what's the first image that comes to mind? This is Angkor Wat, one of the largest and most recognizable religious monuments in the world. Contrary to popular belief, however, Angkor Wat is the name of just ONE temple in Cambodia. “Angkor” actually translates to “city,” and “wat” means “temple.” The whole area of temples and ruins is known as the Angkor Archaeological Park, which covers more than 400 square kilometers. Within this area, there are actually over 1,000 temples of varying sizes and states of decay, from piles of rocks to huge restored temples with details still intact. Easily the most well-known (and perhaps most-photographed) temple here is Angkor Wat, built by Khmer King Suryavarman II in the early 12th century originally as a Hindu temple (it later was changed to a Buddhist one). The temple complex is huge and sprawling, surrounded by an outer wall and a huge moat. 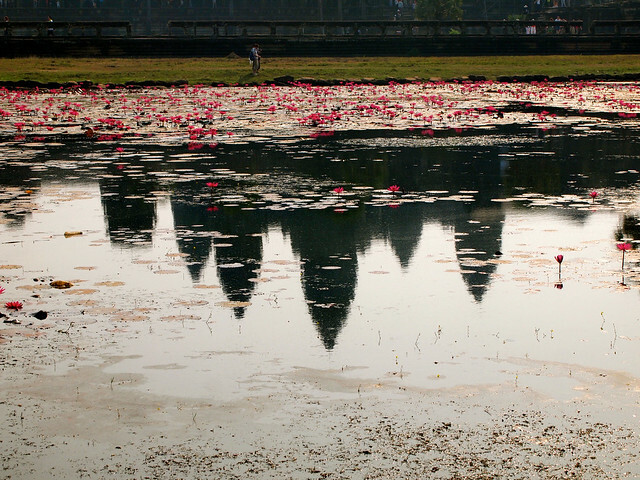 Its 5 lotus-bud-shaped towers make it instantly recognizable — they even appear on Cambodia's money. Seeing as how Angkor Wat it so famous, that also means that it gets incredibly crowded. People flock here before 6 a.m. each morning to line up along the pools in front of the main temple in order to witness the sunrise, and then spill into the temple itself. You could easily get lost wandering around in the lower gallery of Angkor Wat, but waiting in line to climb up to the upper gallery is well worth it, too. While Angkor Wat wasn't my favorite Angkor temple (it was too crowded and there were too many touts inside the temple grounds), I would never tell you to skip it — it truly is incredible. In architectural contrast to Angkor Wat, Bayon is a slightly newer temple complex, built in the late 12th or early 13th century by King Jayavarman VII within the ancient town of Angkor Thom. The Bayon temple is known for one major feature: the huge, serenely smiling faces that cover the temple's towers. Unlike most of the other Angkor temples built for kings, Bayon was built to be a Mahayana Buddhist shrine dedicated to the Buddha. Some say the giant faces are his, while others suggest they are meant to look like the king that commissioned them. Regardless, they certainly add a really interesting element to the temple. Also known as the “Jungle Temple” (or the “Tomb Raider Temple” since some scenes from the Angelina Jolie movie were filmed here), Ta Prohm represents the less-restored, more wild type of Angkor temple. Here, tree roots have curled around pillars and burst up through floors. Moss and vines have crept across walls and down into doorways. The temple, simply, is being reclaimed by the jungle. The wild feeling of this temple makes it one of the most popular in Angkor. The last — and smallest — temple I visited was Banteay Srei. It's not on the typical temple trail in Angkor, as it lies about 25 kilometers (15.5 miles) away from the major site. But it was well worth the extra drive. Built mostly of red sandstone, Banteay Srei is a Hindu temple known for its small scale and intricate wall carvings. Luckily, these carvings have been incredibly well-preserved. Since this temple is so far away from the others, it's a great place to visit if you need a break from the crowds. CONSIDER A TOUR — If this is your first time to Cambodia, going on a tour of Angkor with a guide is not a bad idea, especially if you want to learn more about the temples you're visiting. I was already with a guide since I was on a larger tour around Cambodia, but if you're looking for just a day tour to the temples from Siem Reap, check out the by Urban Adventures. GET A MULTI-DAY PASS — You CAN get just a 24-hour pass for the Angkor temples, but I would suggest going for at least the 3-day pass. This gives you more flexibility, and will ensure that you're not trying to fit everything in to one (likely hot and humid) day. You can also buy a 7-day pass if you're going to stick around Siem Reap longer. GO EARLY — Part of your plan should be going to the popular temples early if possible. If you go to Angkor Wat for sunrise, stick around and explore the temple right afterwards before the real crowds descend. It's also worth going to Ta Prohm early in the morning — you'll avoid the crowds AND be in the temple as the jungle wakes around you. COVER UP — Not only is it culturally friendly and respectful at a religious site, but you literally can't get into certain areas (like the upper gallery at Angkor Wat) unless your knees and shoulders are covered. And no, a scarf/sarong is not sufficient in Cambodia. I wore a longer dress and had a flowy t-shirt that I could throw over it for visiting temples. Based on these photos, which Angkor temple would YOU most like to visit? *Note: A 3-day temple pass as well as guiding around Angkor was part of a complimentary with Intrepid Travel. As always, though, all opinions (and photos) are my own. If you're interested in the Cambodia portion of this same trip, . These photos are just incredible. I’d definitely go for the three day pass as well. Ta Prohm and Banteay Srei are my top 2! Thank you for sharing. I think at least a 3-day pass is essential! The temples are all so different that I think you could easily visit different ones for 3 days and not get templed-out. I WISH I had gotten a 3 day pass to see the temples at Angkor Wat. Unfortunately, I visited with my TESOL group and we only had one day. I got to see Bayon, Ta Prohm and Angkor but it was very rushed. 3 Day would definitely have been better! That’s too bad! But at least you still got to see some of the best ones! Wow, it looks like there is so much to see! I feel like it’s probably impossible to see it all unless you have an abnormally high amount of eyes! Haha, so true! It was also soooo hot and humid when I was there that it was tough to force yourself to climb all over the temples. Very glad that I did, though – they were all so cool and different! Beautiful photo’s Akatuki.. and great post about the temple’s. My image of Cambodia, tho’ is my sister on a motorbike- the very last thing I thought she’d ever ride! Haha! Everyone rides motorbikes in Southeast Asia, though! Most of them can get really crowded, unfortunately. But if you go early in the morning, you can have even the most popular ones to yourself! Thank you! I really love this set! Thanks, Jen! Do they make you want to visit Cambodia? I have been back in 2010! I had an amazing time and I hope to get back and see some more of the country someday. Thanks for the travel inspiration. I’m hoping to make it to Siem Reap in November of this year. How long did you stay in Siem Reap for? I was in Siem Reap for 3 nights. You could easily stay longer if you wanted to see more temples or just hang around the city, but 3 days is sufficient if you’re only there for Angkor! Thanks for the info and great photos, ex-o-lent!! Thank YOU! Glad you enjoyed the post. Nice pictures! True, whenever I think of Combodia, I think of these enchanting temples. They have a certain charm. They definitely are famous for good reason! It’s still kind of amazing to me that I’ve seen something so iconic and exotic in person! Your photos are beautiful. I love the ones of the jungle reclaiming the temples. Great tips on how to visit The Angkor temples of Cambodia. Thanks, Nancy! And yes, the photos of Ta Prohm are definitely some of my favorites – it’s amazing how nature can reclaim things built by man. Love the photos Akatuki! I was just at Angkor Wat a few weeks back! I am so bummed that I missed Bayon and Ta Prohm, those are so beautiful! I wandered for hours and we found some other hidden ones, but the heat and the dust were so intense that we ended up having to leave for fear of heat exhaustion. I’ll need to go back sometime! I really like the shot with the water reflection. Thanks! I quite like that one, too. Wow, I have always wanted to visit Cambodia! I love to learn the history and the cultures to all the places I travel and Angkor looks as though it has plenty. Amazing photos. Great post, thank you for sharing! Definitely lots of history to be learned at these temples! Good to know about Beng Mealea! We actually went to Ta Prohm super early in the morning (right after sunrise), so it was incredibly empty – definitely made the experience better! Akatuki – I have loved finding your site as I have signed up for this exact tour for February. Could you tell me a little more about how you chose the temples you were able to see? I understand the tour provides a guide but did you have the chance to arrange some of your touring on your own at the temples? Any other tips for this Intrepid tour would be much valued as well! Hey Stefanie! Our Intrepid guide decided on the temples, since he was our temple guide (and we were transported around in a mini bus). You of course COULD go see more temples on your own during your free time in Siem Reap since you get a 3-day temple pass. You would just need to arrange your own transport. As for more info on this tour, check out my Cambodia page in my Destinations tab – I’ve written more about this tour, including a review with video! Thank you for the information. I’m looking forward to my tour in February and am grateful to read your insights before I go. I really enjoyed ready this post and learned a lot. It will definitely help me plan my 4 day trip to Siem Reap.